The western European hedgehog (Erinaceus europaeus) is a distinctive but little studied mammal in Ireland. It was first recorded in Waterford in the 13th century. While it is unclear whether it is native, there is some suggestion that it was introduced as a source of food. The hedgehog is a medium-sized insectivore and is probably one of our most recognisable mammals due to its characteristic spines. These spines act as the hedgehog’s main line of defence and if startled the hedgehog will roll up in a ball, leaving just a surface of spines exposed. The Western European hedgehog is the only species of hedgehog found in Ireland and, as its name suggests, it is found in west and central Europe. Other hedgehog species occur in eastern Europe, Africa and Asia, but none in Australia or the Americas, although the Western European species was introduced into New Zealand in the 1870s. While this species has been little studied in Ireland, road kill surveys would indicate that it is widespread throughout the country. In Ireland, male hedgehogs have been recorded to cover an annual range of around 56 hectares, while the range of females is much more conservative at around 16 hectares. A number of factors are thought to influence the distribution of hedgehogs in a habitat, with nest sites, food availability and the presence of predators believed to be major contributory factors. In previous research in other areas of the hedgehog’s range, they are associated with edge habitat and pasture, with coniferous woodland, marsh and arable land being the least preferred habitats. In a study of rural habitat use in Ireland, arable land was selected by hedgehogs particularly just prior to hibernation when building up fat reserves becomes a priority. 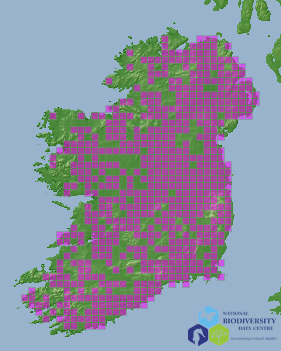 It is thought that the variation in hedgehog habitat use in Ireland may be related to differences in land use practices, which contrast with other areas of the hedgehog’s range, such as the UK. For instance, it has been suggested that arable land is avoided elsewhere because hedgerows are retained less in these areas, whereas most of Ireland’s hedgerow has remained intact since its development in the 18th century. As well as their importance for hedgehog nest sites, hedgerows also benefit invertebrates which would have a knock on effect on insectivores such as the hedgehog. Unlike other mammals that build a secure permanent home, the day nests of hedgehogs are flimsy structures designed for short term occupancy. While hedgehogs may occupy a variety of nests during the active period they do return to individual nest sites. The majority of day nests occur in hedgerow, but hedgehogs have also been found to utilise rabbit burrows, abandoned silage bales, stonewalls and garden sheds. This reflects the hedgehog’s ability to diversify and could explain their success in colonising urban areas. Apart from the nine species of bat, the hedgehog is the only Irish mammal that undergoes true hibernation. Hibernation has been reported in other areas of the species range to begin from October until April or May, but in Ireland the duration of hibernation tends to be shorter with hedgehogs emerging in March. This is thought to be related to Ireland’s milder climate. While some hedgehogs may remain dormant for the entire hibernation period, others may arouse a number of times and move to a new hibernaculum. Hibernation sites are more robust structures, with a short tunnel leading to a chamber composed of compacted leaves. Hedgehogs may lose considerable weight during the hibernation period, with research in Denmark recording weight losses of up to around 40%. In Ireland weight loss was observed to be more conservative at around 17%, with females losing more weight than males. This could be related to the fact that females have less time to build up fat reserves due to raising young and they have been observed to increase their foraging range just prior to hibernation. The diet of hedgehogs is mainly insectivorous with the majority of studies noting high incidences of moth larvae, earwigs, beetles, spiders, harvestman, caterpillars, as well as slugs and earthworms. However, while mainly insectivorous, frogs, small mammals, birds and eggs have also been noted in their diet. Foraging is a time consuming nightly activity, for both sexes of hedgehog during the autumn period. As a hibernating species, hedgehogs are under pressure to gain weight quickly during their active period. The breeding season of hedgehogs generally occurs from April to July. Hedgehogs are not territorial and during the breeding season females may mate with multiple males. As a result males will increase their range during this time to encompass the range of as many females as possible. As a result road kill surveys have observed peaks in hedgehog road deaths during this time, the majority of which are male. Three to six young are born with the majority of births occurring in June. However, in Ireland newly independent juveniles (up to six weeks old) have been observed up to the end of October, so breeding may occur throughout the active period. In some cases it has been found that a female will have two litters in a year. This is particularly common if an earlier litter died. After birth the young remain in the nest with their mother for a month. Males have no involvement with the rearing of the offspring. After a month, the young will leave the nest, accompanied by their mother and learn to forage over a period of two weeks. After this time, at the age of six weeks, they will lead solitary lives. There is little information on whether the young disperse: evidence suggests that while capable of travelling up to 4km in a night, dispersal events are not common. Instead, while juveniles have been observed to make exploratory movements, hedgehogs were recorded at the same site year after year. The European hedgehog is protected under Appendix III of The Berne Convention and under the Wildlife Act (1976) and Wildlife (Amendment) Act 2000. In other areas of its distribution it has been found to be on the decline; in Ireland it is uncertain whether this is also the case. A report on the state of Britain’s mammals in 2011 stated that while the hedgehog population was estimated at 30 million in the 1950s, by the 1990s this had declined to 1.5 million. The intensification of agriculture is considered to be one of the leading causes of this decline. A similar decline in Belgium has been attributed to habitat loss, fragmentation, traffic mortality, poisoning and other human activities. While hedgehogs are capable of surviving up to ten years, in the wild the majority do not survive beyond their second year. In an investigation into the age of road kill in Ireland, 54% was less than one year of age, with males being particularly vulnerable. Hedgehogs are one of the most commonly killed mammals. Badgers have been reported as significant predators of the hedgehog. Predated hedgehogs are clearly recognisable due to the badger’s ability to unroll the hedgehog, leaving nothing but the outer coat of spines. It has been suggested that badgers may limit hedgehog numbers in an area and that hedgehogs negatively react to badger odour. However, in a study in Ireland both species were found to co-exist with just one hedgehog death attributed to badgers over a three year period. In the UK around 30% of hedgehogs were believed to die during hibernation. Late juveniles are particularly vulnerable, with limited time to build up sufficient fat reserves and an inability to build secure hibernacula. Estimates of the weight required to survive hibernation has varied from between 450–650g in the UK to around 513g in Denmark. In Ireland, even late juveniles weighing just 475g on entering hibernation were able to survive. With Ireland’s milder winters, mortality during hibernation would not be expected to be a major contributory factor. This may not always be the case if winters such as that experienced in Ireland in 2010 become more frequent. Amy Haigh completed her BSc (Hons) in National University Ireland Galway, where she conducted her fourth year project on the use by various mammalian species of Terryland Forest Park in Galway City. In October 2011 she completed a PhD on the ecology of the European hedgehog in rural Ireland. This research was conducted at University College Cork, where she also undertook post doctoral research on the red squirrel. She is currently a Postdoctoral Fellow at Teagasc, Moorepark, Fermoy, Co. Cork. Haigh, A., Butler, F. & O’Riordan, R. (2012) Intra and inter habitat differences in hedgehog distribution and potential prey availability, Mammalia 76:3. DOI: 10.1515/mammalia-2011-0110. Haigh, A., O’Riordan, R. & Butler, F. (2012) Nesting behaviour and seasonal body mass changes in a rural Irish population of the Western hedgehog (Erinaceus europaeus) Acta Theriologica DOI: 10.1007/s13364-012-0080-2. Haigh, A., Butler, F. & O’Riordan, R. (2012) Courtship behaviour of western hedgehogs (Erinaceus europaeus) in a rural landscape in Ireland and the first appearance of juveniles, Lutra 55:1, pp. 41-54. Haigh, A., Butler, F. & O’Riordan, R. (2012) A review of techniques for detecting hedgehogs (Erinaceus europaeus) in a rural landscape Journal of Negative Results. Haigh, A., Butler, F. & O’Riordan, R. (2012) Habitat use by the European hedgehog (Erinaceus europaeus, Linnaeus, 1758) in an Irish rural landscape Conference proceedings, AIMS, Irish Naturalists’ Journal. Identifying feature:Spines (of which there are up to 5,000), its ability to roll up in a ball. Number of young:3-6 offspring, generally born around June. Diet:Mainly slugs, earthworms, beetles, caterpillars, but quite a generalist feeder.